THE IMMORTAL SONGS OF EVANESCENCE COMES TO LIFE ON FEB. 19 | Where is Ed Uy? American rock band Evanescence, which has been acclaimed for its extraordinary sound that has been identified with a variety of genres, will wow Pinoy fans with its great hits when it comes to Manila for a concert on February 19 at the Smart Araneta Coliseum in Cubao, Quezon City. Performing on the same stage during the one-night musical event dubbed as “Evanescence Live In Manila!” is British alternative rocker Bush which shall be featured as special guest. The two-in-one presentation from Ovation Production brings to the concert scene two of the hottest groups in rock music during the past two decades as they showcase their exceptional talent and style that catapulted them to the top of the music world. Evanescence is set to conquer rock fans in its debut performance here with its formidable list of hits, such as “Bring Me To Life,” “Going Under,” “My Immortal,” “Everybody’s Fool,” “Call Me When You’re Sober,” “Lithium,” “Sweet Sacrifice,” “Good Enough,” “What You Want,” My Heart Is Broken,” “Lacrymosa,” “Lost In Paradise,” and many more. The following year, its debut live album, “Anywhere But Home,” was released and sold more than one million copies throughout the world. Evanescence’s successful streak continued with its 2006 second studio album, “The Open Door,” which earned for the group its first No. 1 ranking on the Billboard 200 chart and became the 700th No. 1 album in Billboard since the chart became a weekly feature in 1956. This was followed by its self-titled third studio album, “Evanescence,” which was released on Oct. 11, 2011 and debuted at No. 1 on the Billboard 200 chart with 127,000 copies in sales. The band’s major-label debut single, “Bring Me To Life,” featuring guest vocals from Paul McCoy of 12 Stones, became an international hit and reached No. 5 on the American Billboard Hot 100. The song was recognized at the 46th Grammy Awards in 2004, where Evanescence won the Best Hard Rock Performance and Best New Artist Awards and nominated for two others. Evanescence performed at Rock on the Range in Winnipeg, Canada on Aug. 20, 2011 and at Rock in Rio on Oct. 2, 2011 along with Guns N’ Roses and System Of A Down, as well as Brazilian attractions Pitty and Detonautas Roque Clube. Evanescence traces its roots to Little Rock, Arkansas, where it was founded in 1995 by singer/pianist Amy Lee and guitarist Ben Moody. 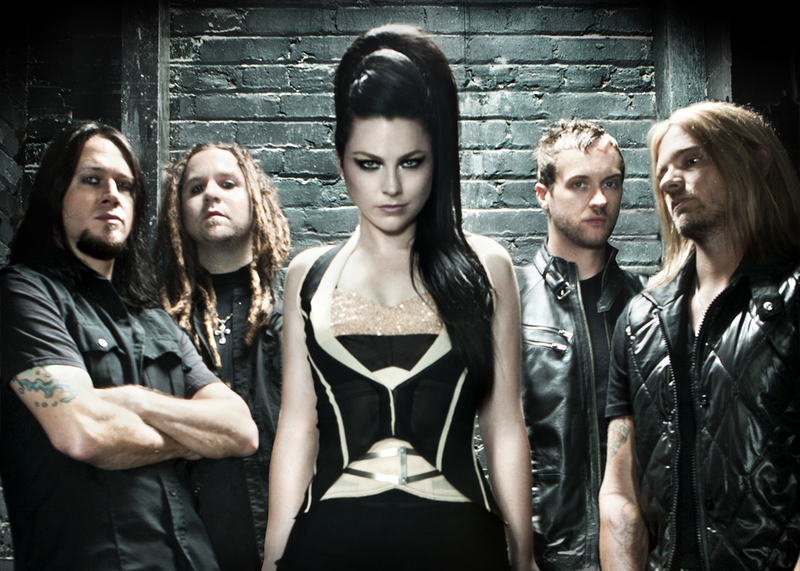 With Amy Lee on the vocals, keyboards and harp, other members of Evanescence are Terry Balsamo – leader guitar (2003-present), Troy McLawhorn – rhythm guitar (2007-2011-present), Tim McCord – bass (2006-present), Will Hunt – drums (2007-present). Bush, on the other hand, emerged as one of the biggest and most commercially successful rock acts in the 1990s with an impressive record that began when its debut album, “Sixteen Stone,” released in 1994, turned into a hit and was certified six times multi-platinum by the RIAA. It scored numerous Top Ten singles on the Billboard rock charts and one No. 1 album from “Razorblade Suitcase,” its 1996 second album. Its 1999 album, “The Science Of Things,” also reached platinum and featured three top-selling singles, notably “The Chemicals Between Us” (No. 1 1n the Modern Rock Tracks and No. 64 on the US Hot 100) and “The Cables Sleep” (No. 4 in the Modern Rock Tracks plus considerable airplay). Bush was formed in London in 1992 by vocalist /guitarist Gavin Rossdale of the band Midnight and former King Blank guitarist Nigel Pulsford, who were later joined by drummer Robbin Goodridge and bassist Dave Parsons (formerly of The Partisans and Transvision Vamp) to complete the ensemble. The present members of the band are Gavin Rossdale -lead vocals, guitar (1992-2002; 2010-present), Robin Goodridge-drums, percussion (1992-2002; 2010-present), Chris Taylor-guitar (2002; 2010-present) and Corey Britz-bass guitar (2010-present). “Evanescence Live In Manila!” is presented by Ovation Productions in cooperation with ETC, 2nd Avenue, Universal Channel and Jack TV. It is also supported by The Philippine Star, BusinessWorld, Manila Bulletin, Talk TV, Diva Universal, Basketball TV, Solar Sports, 97.9 Home Radio, ABS-CBN, Mellow 94.7, Monster Radio RX 93.1, MYX, Edsa Shangri-la Manila and OptimaSignsolutions.